Tired of having flabby arms or maybe you're worried you might get flabby arms? Don't feel bad… I think we've all been there and went on a search of an arm toning workout to finally get rid of the flab or prevent it. No one likes the idea of getting older and having that hang-y down-y flap on your arms. Bat wings? Is that what they call it? When you go to wave or do something and the skin flaps back and forth? Yeah… that's not a cute look. Believe me. After two kids, I have a bit of arm flab of my own I've been working on. When you're focusing specifically on your arms it helps to build the muscles in that area. When your muscles get bigger it helps to fill the excess skin while also toning the skin. We want to build muscle and tone the skin to help decrease the look and minimize flab. Yoga does this by continually going through poses like Chaturanga or other poses where you're using your arms. Even the Warrior poses use your arm strength. Hold your arms out parallel to the ground for two or more minutes and see if your arms don't start to burn. Between your arms burning and your legs burning you'll be able to tone your body if you're consistent. The same goes for doing workouts that aren't yoga. 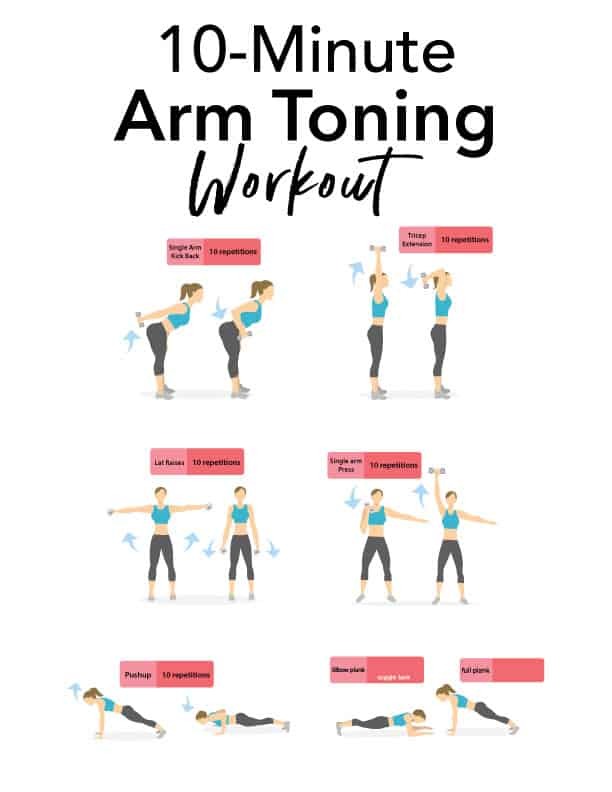 Any exercise that uses the arms (if done correctly) will tone your arms and give them that beautiful and sleek look you're wanting. You don't need to lift extremely heavy or build huge muscles, but if you tone them enough to build some muscle then you'll never have to worry about flabby arms. Just don't stop doing your workouts. That might sound drab, but it's the truth. You'll want to maintain your strength and toning routines as you get older. It will actually help you from injury later on in life. To do this workout you'll need a set of dumbbells, some resistance bands or even some canned goods to use as weights. You don't need special items. You can even fill up old water bottles with sand or rocks to use as weights. Your imagination can create some great weights for this arm toning workout. I would say to at least have something to put under your elbows when you're doing elbow planks. This will help to pad your elbows a little to keep them from digging in the ground. Unless, of course, you're doing them on a soft ground or grass area. You'll want to do 2 sets of 10-20 repetitions of this exercise. I would start at 10 repetitions and work your way up to doing at least 20 repetitions. Also, I would start with a lower weight like 5 pounds or even 3 pounds if 5 pounds seems too much for the higher reps. If that seems easy though, you can always increase the weight. Try to do 2 sets of 10-20 repetitions of this exercise too. The key here is to keep your upper arm as straight as possible and not to move it when you're moving your forearm up and down. 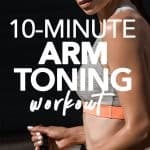 If you're moving your whole arm then it's not really going to have a lot of impact on toning your arm. You need to be engaging and using your tricep muscle. When you're just starting it might be helpful to place your opposite hand on your elbow to feel if you're moving your arm too much while lifting the weight. Don't use your hand to hold it or push your arm, but just keep it there to feel if you're moving your arm. 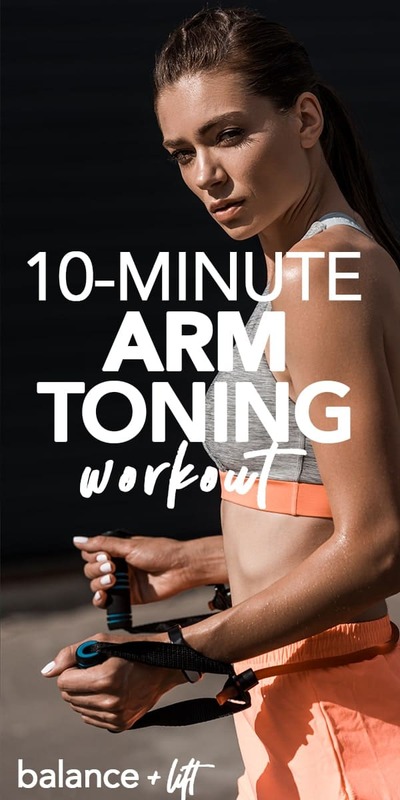 This is probably one of my least favorite exercises, but it's really great for arm toning. Same as above, do 2 rounds of 10 repetitions and breathe through the movements. People tend to shrug their shoulders to where their shoulders come up around their ears, but to get the full effect you need to keep your shoulders down. Keep a mental note of where your shoulders are throughout the exercise and try to push them down as you raise your arms up. Just like with the lateral raise, in the single arm press, people tend to shrug their shoulders. Try not to do that because it will cause you to have neck pain later. Go for 2 rounds of 10 repetitions and keep your gaze focused forward. You can either hold your opposite arm out to the side or hold it down by your side. If you want to work both arms at the same time you're more than welcome. Give it a shot and see which feels better to you. If you can't do a full push-up then I would suggest finding a bench or something a little elevated off the ground (like a couch or chair) that is well secure that you can do your pushups on. This will help you build strength before going to the full version. I don't suggest going to your knees because I've noticed a lot of women tend to get stuck doing push-ups on their knees and not really advancing. But, doing inclined push-ups allows the transition to full push-up to be easier. Do 2 rounds of 10 pushups to start. If you can't do that many then do as many as you can in each round. Don't cop out either. Do as many as you can and push yourself. For this, you'll be transitioning between elbow plank and full plank. You'll want to keep your core engaged rather than sagging in the middle. You'll be doing 2 rounds of 10 repetitions of transitioning between elbow plank and full plank. So, going from elbow plank to full plank and back is one repetition. You don't have to go fast between them, but it should be controlled. If you want to really challenge yourself you can hold for a few seconds while in both elbow plank and full plank. This will work your core also. Try to perform each of these exercises with good form without going super fast through each one. The better your form the less room for injury. If you can't perform an exercise safely then take a break and come back to it. You never want to push yourself so much that you injure yourself. Be smart and know when you've done too much. You should aim to do this workout at least 2-3 times per week to see the best results. You want to give your muscles enough time between workouts to recover. If you're not recovering well you won't see results. How do you know if you're recovered? Basically, if you're realllllyyyy sore… you shouldn't be working out. If your muscles are only a little sore, then it's ok to workout. You never want to be so sore that it's really uncomfortable to do things in your daily life. If you're at that point then you probably need to change your weight or do fewer repetitions. This workout is fully adjustable and can be done how your body feels it needs to be done as necessary.